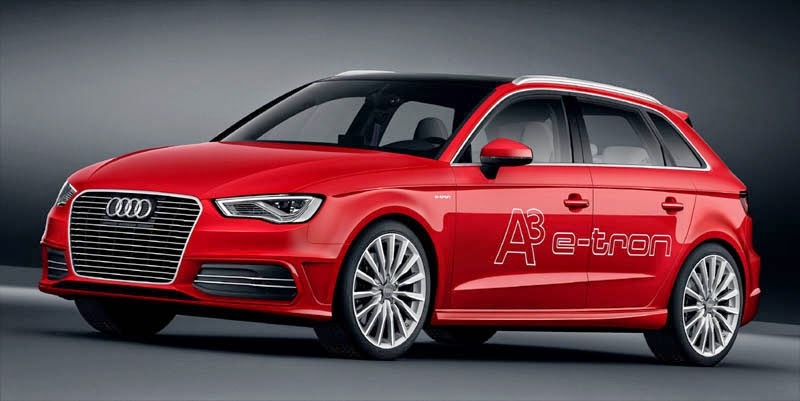 The first plug-in hybrid from Audi, the A3 Sportback e-tron, is now available to order for customers in Europe. Approximately 410 Audi dealers in Europe – including no fewer than 105 in Germany – are selling the A3 e-tron at a basic price of 37,900 euros on the German market. 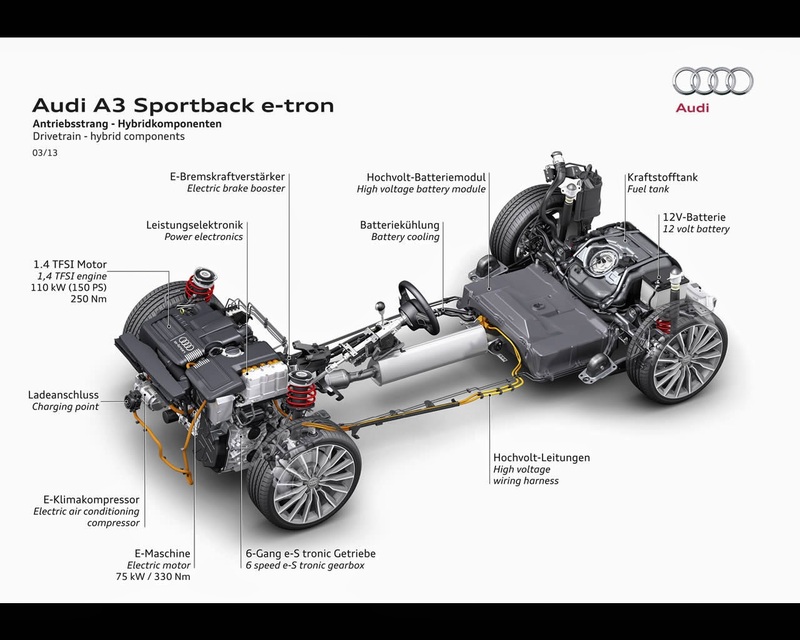 An individual installation check, the “e-tron plus” special package and “green” power from Audi complete the offering for the Audi A3 Sportback e-tron. The compact electric car will be handed over to its first customers this winter. The Audi A3 Sportback e-tron brings together a 1.4 TFSI gasoline engine and an electric motor, giving the compact automobile a system output of 150 kW (204 hp). The A3 Sportback e-tron’s fuel consumption in accordance with the NEDC standard for plug-in hybrid vehicles is just 1.5 liters of fuel per 100 kilometers (156.8 US mpg), with CO2 emissions of 35 grams per kilometer (56.3 g/mi). Under electric power alone it has a range of 50 kilometers (31.1 mi), and over 900 kilometers (559.2 mi) in combined mode. The basic price for the Audi A3 e-tron in Germany is 37,900 euros. Audi is also offering attractive leasing conditions: 319 euros per month with a term of 36 months. In Germany, the plug-in hybrid will be sold by 105 selected e-tron dealers; across Europe approximately 410 dealerships will sell the model. Their employees are receiving special training in sales and service relating to electric vehicles. Between mid-July and the end of August, Audi is providing training to around 2,000 sales, service and used car employees from all over Europe at its Training Center next to Munich. In addition, some 300 German high-voltage technicians and service advisors from Audi will undertake a technical training course at the Service Training Center in Neckarsulm. In future, every e-tron dealer will also have at least one charging station that e-tron customers can use, even after their purchase. The Audi A3 Sportback e-tron can be charged quickly via a charging point at the dealership, within the public charging infrastructure or at the customer’s home. For the latter option, Audi offers – in Germany – an individual installation service whereby a technician checks the electrics in the customer’s home, makes any adjustments that may be required and installs the charging dock, which is designed for safe, convenient charging. To ensure that sustainability is not compromised during the at-home charging process, customers in Germany can switch to environmentally friendly electricity, known as Audi energy. With Audi energy, the A3 Sportback e-tron is totally emission-free when operated electrically. All electricity all comes from hydroelectric power stations in Germany, Austria and Switzerland. To mark the start of the A3 Sportback e-tron, Audi has additionally put together the attractive “e-tron plus” package. In Germany it includes the charging dock, a cable for public charging points, MMI navigation plus, Audi connect and phone box.